If you're involved with designing your sales process, you may have heard of the term sales enablement. Businesses and consultants use this term in many ways, so I wanted to take some time to clear up what it means and why it's important to you. Sales enablement has four main tenets, which we will cover in detail in this article. 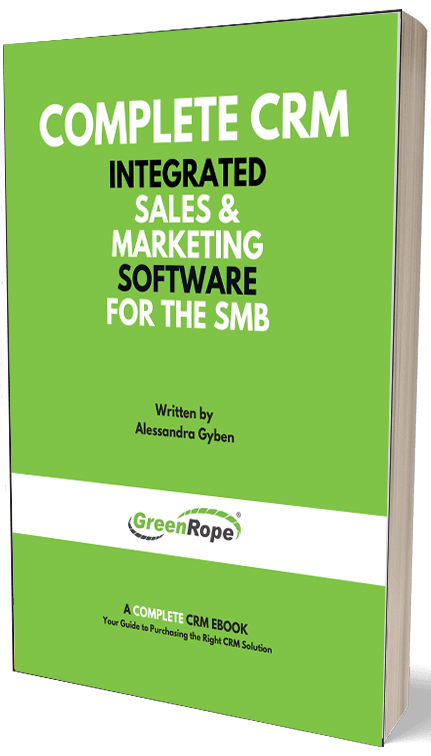 GreenRope's integrated Complete CRM makes sales enablement easy because all of these elements are built directly into the GreenRope platform. No extra development work is required. All you have to do is come up with a plan and execute on it. Getting salespeople up to speed on your sales process takes time, and can be labor intensive if you don't have some way to automate your training. The best tool to make onboarding new sales team members easilyy is to build a curriculum with the GreenRope Learning Management System (LMS). Learning management systems are designed to present educational information to someone and confirm they have absorbed the material. Sales training is no exception. A good training program can make this process efficient and repeatable. Education about what you sell is an important part of the sales process, and one that is easy to automate. If you have white papers, e-books, or other helpful resources that your salespeople can use, make it easy for them to access it and send it to their leads as well. Once you have built some of that content, put it in your media library. If you want to have it downloadable, be sure to use links in the emails you send or reference those files with GreenRope's "public download" link, which will automatically track each download. If you can present the content with a drip campaign, that is an easy way to automate gradual release of that information in smaller pieces. The advantage to GreenRope's drip campaign system is that it is easy to initiate - just add someone to a group and they automatically start getting that sequence of emails. Every action (read, click, bounce, unsubscribe) is automatically managed and added to the CRM and contributes to lead scoring. If you want to get more advanced, use GreenRope's Journeys tool to build more complex logic into your marketing automation. Journeys let you build any amount of custom process into sales and marketing automation - it is truly only limited by your imagination. Personalization plays a large part in how contacts engage and react to your content. Beyond just "Dear Firstname", think about how you can use what you know about the contact to really customize what each lead sees. This customization could be based on demographics (e.g., if someone is over 50 years of age, they may be interested in seeing information presented differently than someone under 30), or interests (e.g., if you know the lead is interested in a particular aspect of what you sell, add more information about that in the message), or behavior (e.g., if the contact came from a particular campaign, there may be content relevant to that campaign that you want to include). Make it easy for the salesperson to access and send educational content to their lead. In GreenRope, workflows are a simple way to empower salespeople to automate their sales processes. A workflow can add someone to a group (thereby kicking off a drip campaign), start/stop/pause someone on a customer journey, assign a CRM activity, send an email or text message, and more. To gain a complete understanding of the sales process, head over to our website JourneyFlow.com and plug it into that system. JourneyFlow.com is a free tool you can use to visualize the customer journey. Look at places where you need human interaction (e.g., when is a phone call necessary), and when you can automate interactions. Involve your sales, marketing, and customer service teams so everyone is on the same page. You need GreenRope's robust reporting to get a deeper understanding of what is working, and how you can improve your sales process. There are a lot of tools at your disposal to help you gain insight into how effective your sales process is. GreenRope's CRM activities reports provide useful tools to give you a sense of how active your sales team is. Look at CRM Activities Completed to see what kind of workload your team is under. Use the leaderboard to connect lead scoring with quotas and get a feel for how effective your team is at accomplishing tasks. Set up your lead scoring under the Automation tab, and define the activities that are used to contribute to the leaderboard. The CRM Timeliness report is a helpful tool that shows you how well your team is handling the activities assigned to them by showing if on average they are ahead or behind schedule. These reports are available by activity type and by user, so you can also see if any one person on your team is having a hard time meeting deadlines. Drip campaign reports are a good way to see an aggregate performance of the automated emails you send to leads. Journeys provide similar insight in the Email Tracking area, and on the Journeys page. The venerable funnel chart is a good way to see how effective your sales process is. Be sure to take advantage of filtering, so you can see how different campaigns perform relative to each other. Check in different date ranges to see if your performance is improving, and track time in funnel along with percentages of contacts who are successfully moving from stage to stage. Use the helpful funnel planning tool to estimate how you can calculate ROI in different scenarios. Sales enablement is as much your company culture as it is the software that makes it all possible. Use GreenRope to easily pull these components together. If you're not sure about how to execute on your strategy, let us know - we're happy to help share our experience and vision. We can assist in design of journeys, content, and strategy.